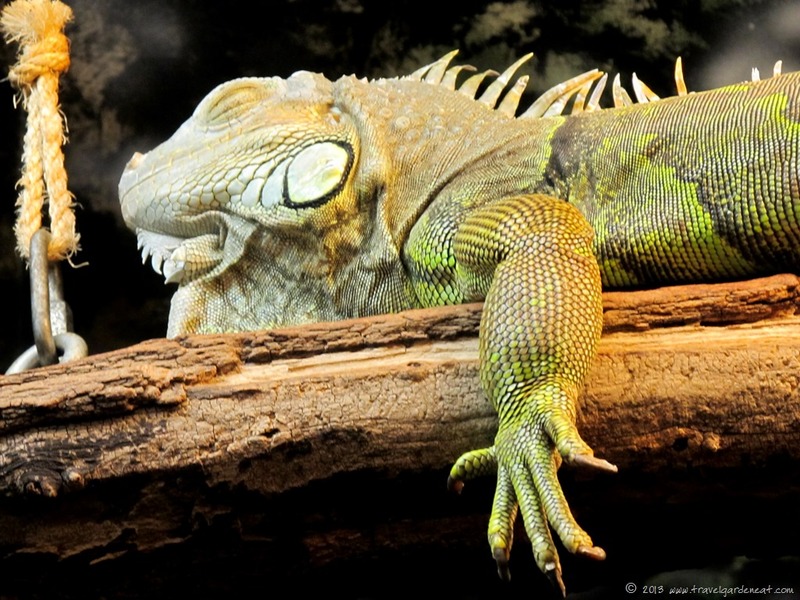 Never Too Old for the Zoo – Travel. Garden. Eat. It had been years since my last trip to the Lake Superior Zoo — we used to visit regularly when our boys were younger, but the teen years bring a whole new round of interests and activities. With news of a recent birth, and a pleasant summer afternoon, I decided it was time to return and spend a couple of hours wandering the grounds. Perhaps you might like a peek at the star attraction? 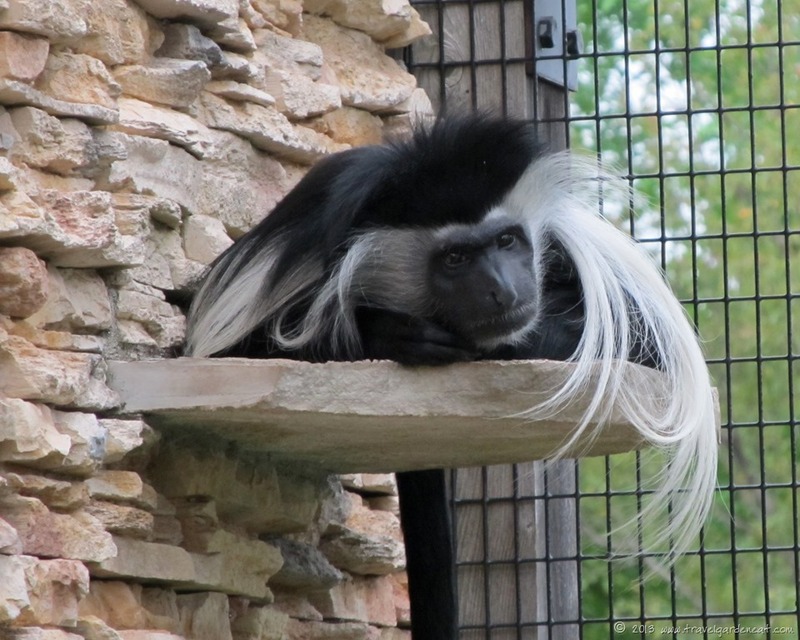 — a baby Angolan Colobus monkey! During our visit, mama Kelly and daughter Kero carefully guarded the baby, almost a month old at the time we saw the family. Little did we know at the time that Kero was expecting an addition of her own, born just a few days after our visit! I assume the melancholy fellow on the ledge is Kraemer, the father to both babies . . . he was a busy fellow five or six months earlier! The Lake Superior Zoo is not large, but enjoys a picturesque setting, with Kingsbury Creek running through the grounds. 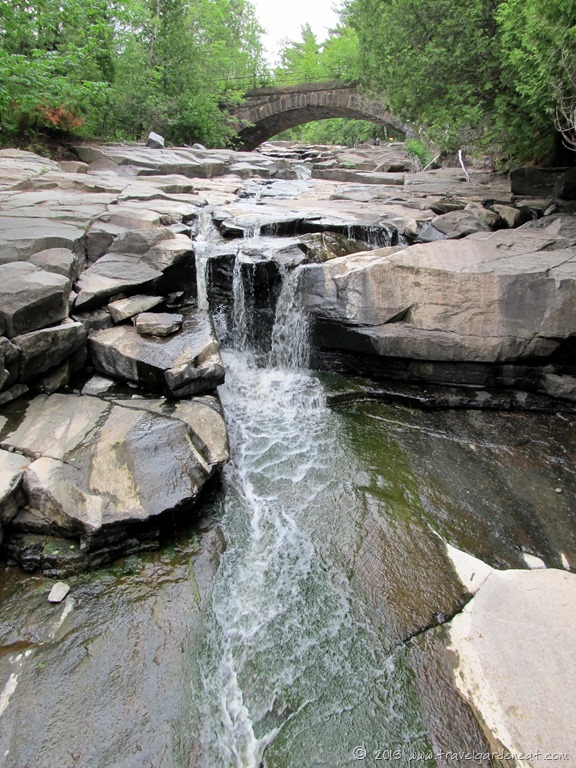 This lovely creek turned into an unfortunate raging torrent of water during Duluth’s devastating flood of 2012, resulting in 14 animals losing their lives, including many barnyard animals. 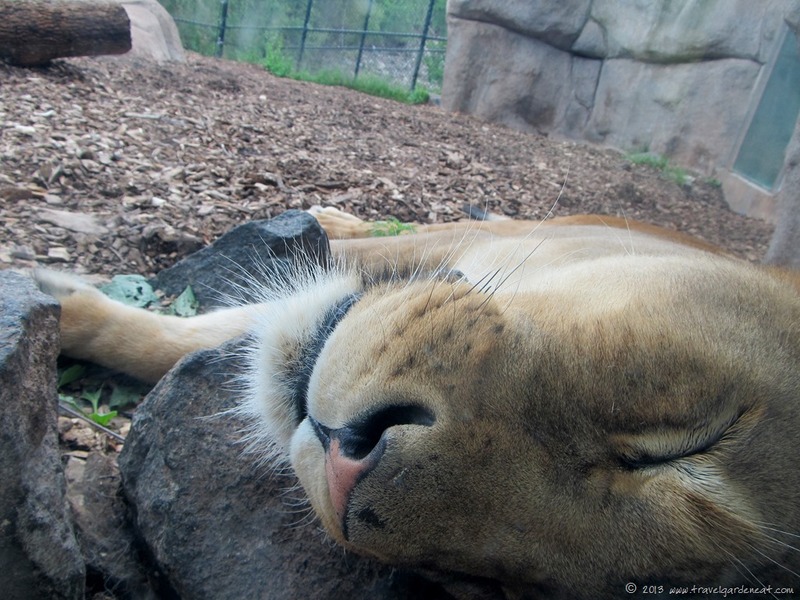 A year later, it was wonderful to see that the Zoo has added many new animals, repaired and renovated much of the damaged grounds, and provided again a tranquil spot for families and visitors to spend a pleasant morning or afternoon. Old favorites still reside at the Lake Superior Zoo, as well. I always feel torn and conflicted when visiting zoos — observing wild animals who arguably should be enjoying their native and wild settings. 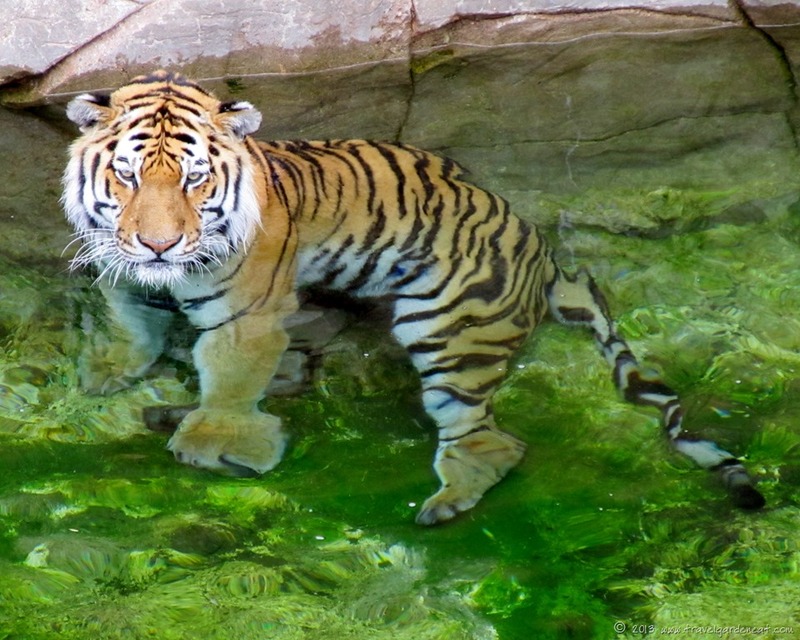 However, properly managed zoos can play a critical role in preserving endangered species, and in educating the public on the importance of wildlife and habitat conservation. 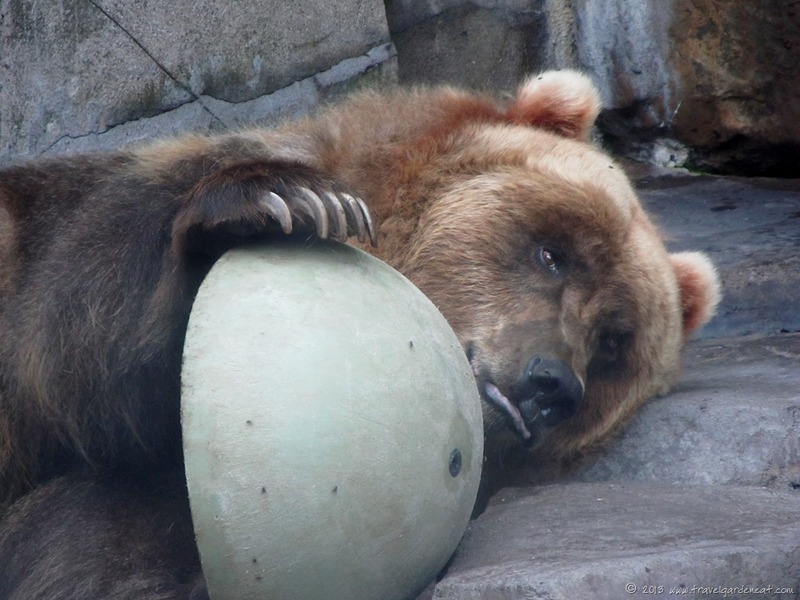 Many of the animals on display and residing in zoos would otherwise have met a premature end — such as Trouble, the Alaskan brown bear who had a penchant for breaking into the Alaska Zoo and no longer feared humans. Would I rather see an Amur tiger in the wild? Of course I would. And, perhaps, some day I will! Is it more thrilling to see a wolf loping across an isolated highway in the Northwoods, as opposed to trotting around a large enclosure? No comparison! But, someone else may not have the opportunity to experience a wolf in its natural setting, and a zoo or preservation center might help provide a visitor with a new appreciation for that majestic creature, and inspire new efforts of conservation. The next time you visit a zoo, I hope that you are reminded of another species or corner of this wonderful world that is worth preserving. “In every remote corner of the world there are people like Carl Jones and Don Merton who have devoted their lives to saving threatened species. Very often, their determination is all that stands between an endangered species and extinction. But why do they bother? Does it really matter if the Yangtze river dolphin, or the kakapo, or the northern white rhino, or any other species live on only in scientists’ notebooks? Well, yes, it does. Every animal and plant is an integral part of its environment: even Komodo dragons have a major role to play in maintaining the ecological stability of their delicate island homes. If they disappear, so could many other species. And conservation is very much in tune with our survival. Animals and plants provide us with life-saving drugs and food, they pollinate crops and provide important ingredients or many industrial processes. 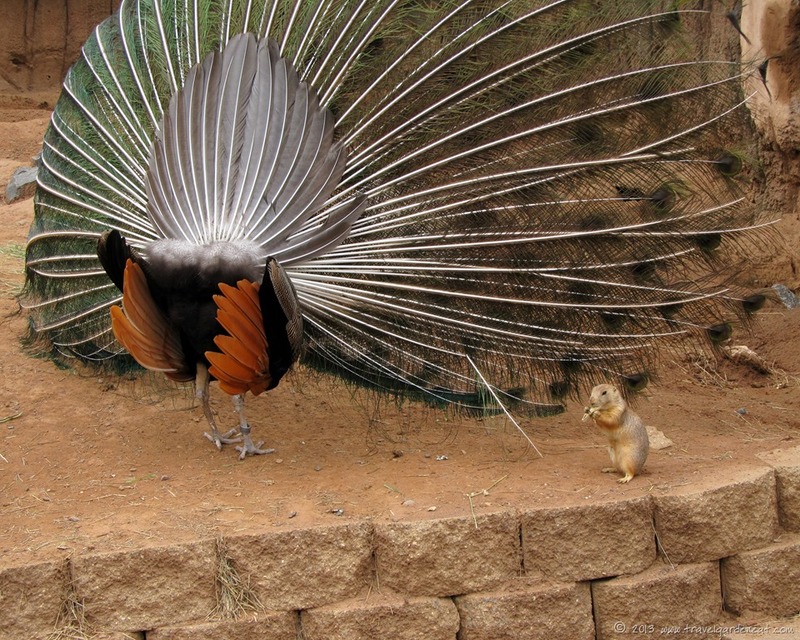 Ironically, it is often not the big and beautiful creatures, but the ugly and less dramatic ones, that we need most. Even so, the loss of a few species may seem irrelevant compared to major environmental problems such as global warming or the destruction of the ozone layer. But while nature has considerable resilience, there is a limit to how far that resilience can be stretched. No one knows how close to the limit we are getting. The darker it gets, the faster we’re driving. How tragic that the floods impacted the zoo so severely. It sounds like you’ve a little gem in your area. There will be a place for zoos until we can guarantee that habitats will be safe-guarded and the inhabitants fully protected. RIght now, neither is even remotely possible. Nice photos, Kat! This was a wonderful post! Our regional zoo is a sad visit. But I do know there are zoos that exist for preservation of a species and contribute to well-being for their animals and birds. Beautiful photos, Kat! I could not agree more–you’re never too old to visit & enjoy the zoo. Even though my children are older too, we still trek to the zoo occasionally and always learn or see something new. Animals are fascinating! Zoos always help remind me of the complexity of the natural world, and even though artificial in many respects, still provide a glimpse into those fascinating creatures many of us otherwise would never have the privilege of observing elsewhere. Wonderful pics Kat! You are right, one is never too old to see these animals. Sorry to hear about the floods. Duluth was fortunate in that floodwaters recede quickly unlike other areas where waters may stand much longer — but for those affected, it was no less painful. Thanks for your comment, tiny. When my kids were little we would frequent the Brookfield Zoo (just outside Chicago) and I too always had mixed emotions. I remember last years devastating flood…very sad. Glad to hear about the recovery. You managed to capture some amazing shots…..really enjoyed! 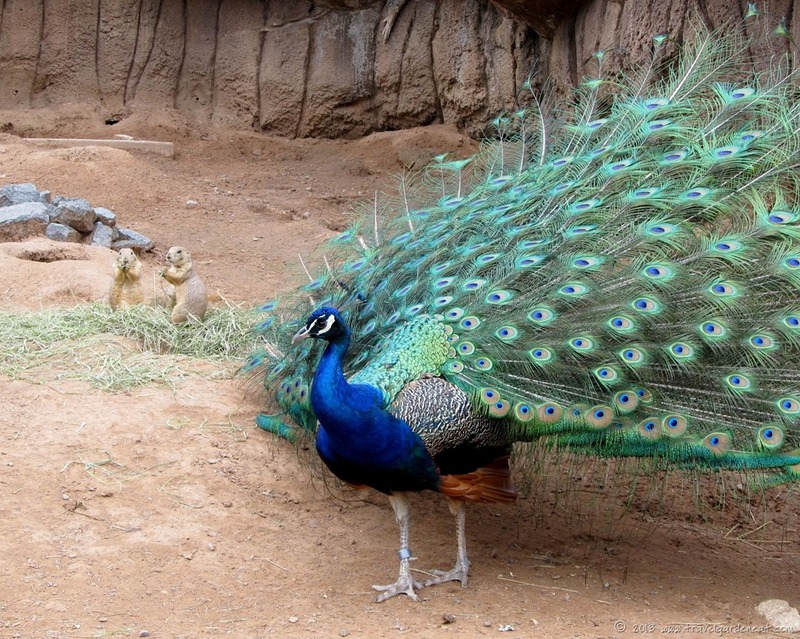 I have had the chance to visit the Brookfield Zoo several times over the years — a couple of times growing up and then once when my boys were younger. It really has some wonderful sights — and such massive grounds! Thanks, Ingrid. I always enjoy your photos, but these are particularly lovely. Nice work!! Thank you, V! It was a surprising pleasure to meander the grounds and try to capture a different angle than I had in the past. I often thing my kids are too old for the zoo, but every time we visit one, they are as thrilled as ever! I like the part on preserving endangered species, not only is it our duty but a smart idea to preserve the ecological balance of our universe! Amen! And it is interesting how some of the kids’ interests change over time, in terms of the exhibits or aspects of the zoo they find captivating as they get older. Appreciate your comment, Amy — thank you! Well written, and those monkeys sure are gorgeous babes, aren’t they? 🙂 I understand the ambivalence about zoos, and it’s good to remind us about the good they do. Thanks for your comments, blue — I need to get back to see the two monkey babes playing together now! I agree that zoos are necessary to make people aware of what is at stake. Wish ours were nicer. 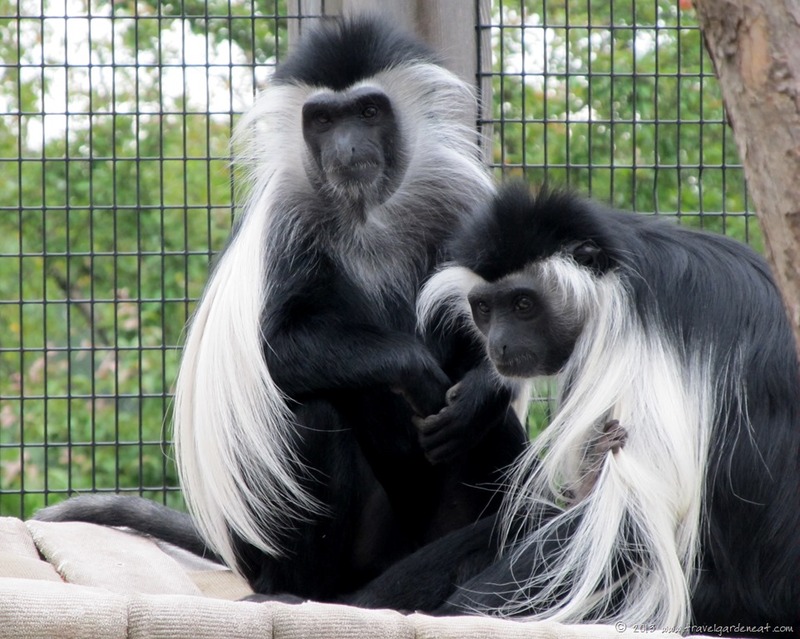 Your photos, especially those of the Colobus monkeys, are just fabulous. And that powerful excerpt at the end packs a lot of punch. 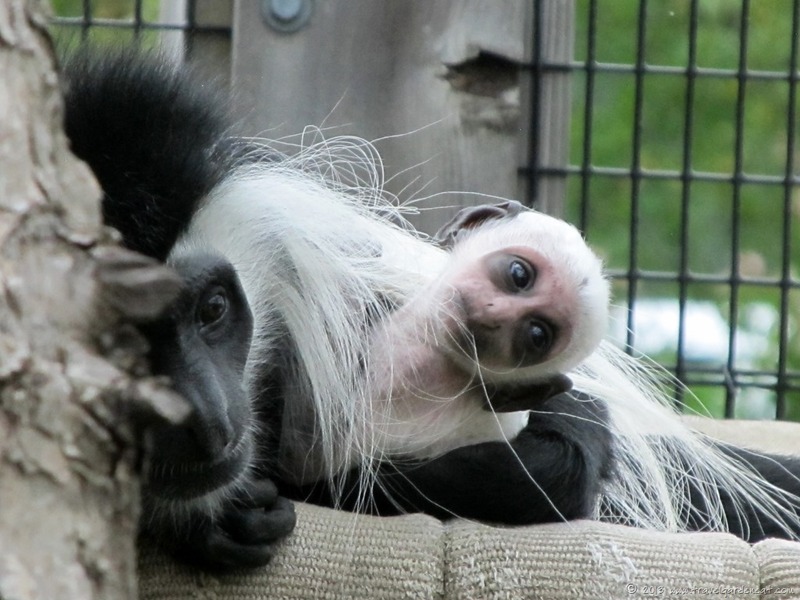 The Colobus were so interesting to watch as they interacted and jointly cared for the baby. I really have to find time to get back and see the second addition! I think you are never to old to visit a zoo and see so many wonderful creatures that most people would never have the opportunity to see otherwise. Seeing, enjoying, loving, then saving them for future generations. So true, Karen — and so nicely stated!